Well identified as the ‘Shining Tree’, Birch tree sets a remarkable note in the field of ancient and modern medicine for its preventive and defensive actions against rheumatism, skin disorders, circulatory problems and dental mayhems. Being a priceless tree of the ancestral origin, Birch and its essential oil were widely utilized since the primitive times, dating back to the Paleolithic and the Mesolithic era as an adhesive and for various other uses. Adhering to the meaning of its name (tree which is used for writing purposes), Birch has been extensively used for preparing manifold documents in olden days, which are now termed as Birch Bark Manuscripts. Fulsome with spiritual and cultural importance, Birch tree is crowned as the National tree of Russia and Finland. The most special fact about Birch tree is that it resists all kinds of adverse soil and climatic conditions. The bark of this tree has been used for numerous purposes such as construction, writing and medicinal applications. This tree was also called as ‘Lady of the Woods’, for its elegance, charm, lightness and the mesmerizing aroma after rain. The Native Americans used Birch in their folklore remedies, where it was taken along with beverages to deal with various health conditions associated with the stomach including dysentery, diarrhea and indigestion. The essential oil obtained from the bark of this tree has been used in hair care and skin care products to drive away dandruff, hair fall, eczema, psoriasis and dermatitis. The sap of the inner bark is a rich source of nutrients and was used in making cakes and is predominantly known to the world as a famine food for its ability to satiate hunger as a last choice if not anything is accessible. Birch essential oil has been used as a disinfectant, powerful insect repellent, and also in the treatment of skin infections, fever, kidney stones, eczema and rheumatism. It is also a key ingredient in various perfumes including the most popular Russian Leather fragrance and Iceland Wintergreen. In various folk medicines, Birch was used in transfer magic remedies for alleviating rheumatic pain and other associated symptoms. The aromatic leaves of this tree were also used in making Birch tea, which was used as an effective remedy for dissolving kidney stones, alleviating pain, gout, dropsy and rheumatism. The remedial properties of Birch essential oil are anti-rheumatic, anti-arthritic, febrifuge, diuretic, astringent, detoxifying, analgesic, depurative, antiseptic, stimulant, germicide, tonic, insecticide, and anti-depressant. The major chemical constituents contributing to its therapeutic properties are betulene, methyl salicylate, betulenol, creosol, salicylic acid, and guaiacol. The word ‘Ayurveda’ has become the most common terminology in this contemporary living as many are becoming conscious about their health. When absolute health is the need of the hour, then natural remedies and chemical-free medications come along without any say and this where Ayurveda comes into picture. Besides being a natural healing methodology, Ayurveda is a holistic system that helps in leading a disciplined life, including guidelines for a balanced diet to a modest lifestyle. Ayurveda is the oldest of all medicinal systems on earth and it completely trusts that Mother Nature has the cure for all ailments including physical disorders and mental mayhems. It is also said that living in harmony with Nature gifts a disease-free, harmonious and healthy life. According to this philosophy everything on earth is a combination of the 5 fundamental elements of nature. They are fire, earth, water, space and air. For a better understanding, it is clearly depicted that earth is the representation of the bones and muscles, fire is the heat energy generated in the body for many vital functions of the system like metabolism, water stands for blood and other fluids, we breathe air and space is the representation of our soul that harmonizes all the other functions of the human body and keeps us alive. Ayurvedic healing relies upon nature and it strongly states that all the other things on this planet are being created just for the happiness of mankind. You can identify this with the following example; Mother earth has 92 elements, including magnesium, calcium, iron, potassium etc, and the human system also has all these 92 constituents. When a person is ill due to the deficiency of any of these elements, say iron, he/she is advised to take dates, which is rich in iron and to our astonishment dates grow by engrossing iron content from the earth. Simply brilliant, isn’t it? Every human being is regarded as a unique part of nature in Ayurveda and it is also recommended that the remedial measures should also be unique based upon their unique individual constitution, which comprises of three biological energies called as doshas (also known as Tridosha) namely vata, pitta and kapha. Pitta represents fire and water, vata is a combination of air and ether, and kapha signifies earth and water. Pitta energy is responsible for body temperature and metabolism, kapha controls the physical appearance, movement of fluids in the system and sustenance and vata dosha regulates the functions of the nervous, circulatory and respiratory systems. Your first Ayurvedic consultation will help you in identifying your unique individual constitution and your predominant dosha type, which has an upper hand in determining your physical and mental makeup. Perfect balance between these doshas signifies well-being and disparities due to unwholesome food habits, change in climatic conditions, lifestyle and immoral behaviors leads to sickness. The most significant Ayurvedic remedies that focus on treating doshic imbalances are herbs, plant essential oils, meditation, simple physical exercises, yoga, Pranayama or balanced breathing practices, Ayurvedic routine, prayers and a balanced diet. Rheumatism is generally regarded as a medical condition caused due to excess deposits of fluids in the system along with the built up of toxic substances and improper blood circulation that lead to inflammation, pain, redness, stiffness and irritation. According to Ayurveda, rheumatism is majorly a kapha imbalance disorder and can be treated with Ayurvedic remedies that reduce kapha vitiation. Birch oil has anti-rheumatic and anti-arthritic properties that aids in alleviating these agonizing conditions and reduces excess kapha dosha. 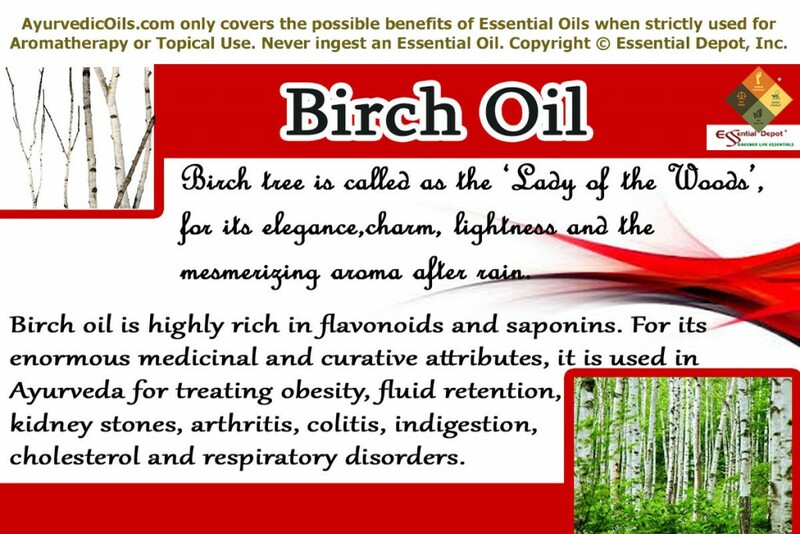 Birch essential oil is known as an effective pain reliever with the presence of the salicylate component that is present in aspirin based medications. This compound helps in lessening pain, swelling and stiffness associated with rheumatoid arthritis, osteoarthritis and other pain in the joints and muscles. It works by arresting the body’s production of prostaglandins hormones, which are responsible for pain, inflammation and other similar conditions. Along with these attributes, the essential oil of Birch also has detoxifying, diuretic and depurative properties that assist in eliminating toxins from the body, discarding salt, uric acid and excess fluid deposits in the body by promoting sweat and frequent urination and by purifying the entire system. Being a circulatory agent, this oil also helps in promoting proper circulation of blood and lessens the severity of circulatory disorders like rheumatism and edema. Massaging the affected parts with 2 drops of Birch oil, 2 drops of Ginger oil and 2 drops of Tea tree oil along with 3 ml of coconut oil can help in reducing pain, inflammation, redness and promote proper blood circulation that helps in treating rheumatic and arthritic conditions. You can also add 2 to 3 drops of Birch oil in warm compress and in warm bathing water that can help in improving your medical conditions related to rheumatism and other muscular and circulatory problems. Birch essential oil is always one among those best natural remedies that assist in relieving severe congestion, long-term allergies and other respiratory infections. With its expectorant, anti-microbial and anti-inflammatory properties, Birch essential oil supports the system in fighting against chest congestion, bronchitis, nasal congestion, pneumonia and bronchial congestion. Kapha dosha is a combination of water and earth elements and imbalance of kapha dosha leads to excess level of water deposits, amassing of mucus and phlegm deposits and building up of toxic substances worsening respiratory problems. Birch essential oil is used in Ayurvedic healing for correcting kapha imbalance by generating heat in system and discarding mucus and phlegm deposits in the lungs and the respiratory passages. Adding 2 to 3 drops of Birch oil in steam inhalation can aid in loosening mucus accumulation, treating stuffed nose, nasal, chest and bronchial congestion and combats the effects of toxins and microbes in the body. You can mix 2 drops of Birch oil, 2 drops of Peppermint oil and 2 drops of Lavender oil along with your regular vaporizing ointment and massage in gentle movements on throat, chest and back for quick relief. A hot compress with 2 drops of Birch oil, following this massage on the back and chest can help improve respiratory conditions at ease. Birch is such a magical oil that can relieve severe pain in a matter of minutes. With the presence of the salicylate component in aspirin and other pain-relieving pills, Birch oil aids in lessening pain by causing numbness on the painful area and uplifts the nerves and muscles. Along with the Alternative and Complementary medicinal practices, the Allopathic doctors also recommend Birch oil for relieving severe pain, preventing the joints from swelling in cases of dislocation of joints or fractures. Gently massaging the painful parts with 2 drops of Birch oil and 2 drops of Lemongrass oil along with 2 ml of olive oil can aid in easing muscular pain and stiffness. It also helps in alleviating muscular spasms and bout. 3 to 4 drops of Birch oil combined with 4 drops of Helichrysum oil and 4 ml of coconut oil massaged on the affected parts will work like a fascination especially on carpal tunnel syndrome. Mix 2 drops of Birch oil with 2 drops of Lavender oil and 2 drops of Frankincense oil along with 3 ml of Sweet almond oil and apply it on wounds, cuts, skin rashes, cellulites, ringworm, eczema, itches and insect bites for quick relief. This formula works with the disinfectant, antiseptic, anti-bacterial and germicide properties of Birch oil that kills infectious micro-organisms like bacteria and fungi in skin infections and wounds and promotes quicker healing. There’s no wonder that an admirable essential oil like Birch has the therapeutic effects for treating oral problems with its anti-bacterial, antiseptic, disinfectant, astringent and germicide properties. These remedial values help in treating oral problems like weak gums, cavities, bacteria, painful gums, plaque and halitosis or bad breath. 1 drop of Birch oil along with 1 drop of Spearmint oil added to a cup of warm water can be used as a natural gargle formula for combating germs and bacterial growths in the mouth, strengthening the gums as an astringent, protecting the teeth and gums from infections as an antiseptic and also for keeping away from bad breath by refreshing the mouth throughout the day. This therapy can be followed twice a day in the morning and night. Birch is yet another nourishing oil for controlling loss of hair, maintaining those beautiful locks, preventing dandruff, enriching the scalp and promoting growth of hair naturally. Just 1 drop of Birch oil in your regular shampooing can aid in healing your hair problems and deliver quick results in re-establishing your hair growth. Massaging your scalp with 3 drops of Birch oil mixed with 3 drops of Ylang Ylang oil, 3 drops of Rosemary oil, 2 drops of Lemon oil and 2 drops of Lavender oil along with 7 ml of Virgin olive oil can help in moisturizing the scalp, controlling dandruff with its anti-fungal properties, strengthening the hair follicles with its astringent properties, promotes hair growth and grants the natural lustrous, shiny and glossy look of your hair. Follow this massage with 2 drops of Birch oil added to your mild shampoo for promising results. A 1994 study at the University of North Carolina concluded that “the chemicals found in white birch bark slowed the growth of HIV”. Various other studies conducted on the betulinic acid present in Birch essential oil have been proved to possess anti-tumor properties and kill cancerous cells. Birch essential oil is also used in the treatment of colitis, bladder stone, gout, headache, candida, multiple sclerosis, depression and urinary disorders. This editorial is meant only for the use of education and information. It is not in anyways intended to treat, cure, prevent or diagnose any medical condition or replace any prescribed medication or medical advice of a healthcare expert. We are medical professionals and this information is shared only with the concern of bringing out the importance of Ayurveda, the mother of all healing systems on earth. Make sure that you speak with an Ayurvedic expert before using the perfect essential oil for your prakriti or individual constitution and state of health. Do not ingest essential oils or use it for internal purposes and ensure that you always employ essential oils in a diluted form, as 100% pure and organic essential oils are extremely concentrated substances and may cause allergic or hazardous reactions, if used directly for topical application. Keep essential oils out of reach of children. 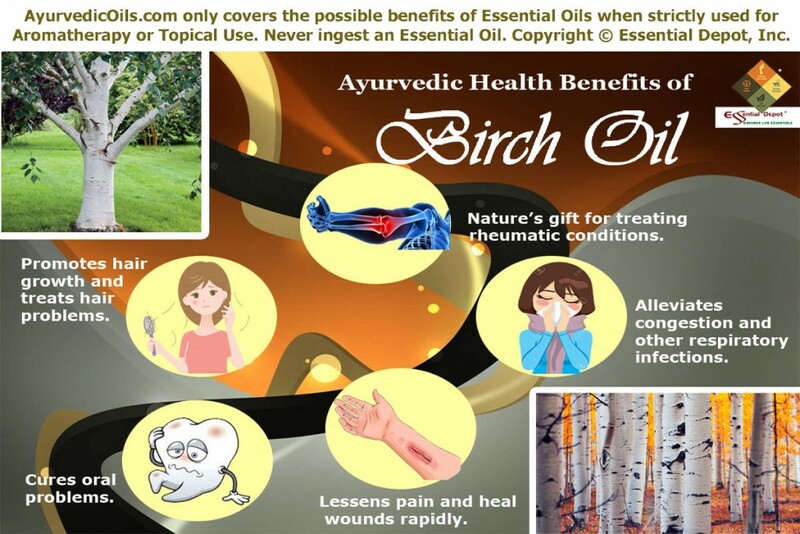 This entry was posted in Essential Oils - Learn About and Purchase and tagged Ayurvedic health benefits of Birch oil, Ayurvedic oils for arthritis, Ayurvedic oils for bronchial congestion, Ayurvedic oils for dandruff, Ayurvedic oils for dislocation of bones, Ayurvedic oils for gum problems, Ayurvedic oils for hair growth, Ayurvedic oils for hair loss, Ayurvedic oils for halitosis, Ayurvedic oils for headache, Ayurvedic oils for joint pain, Ayurvedic oils for respiratory infections, Ayurvedic oils for rheumatism, Ayurvedic oils for urinary problems, Ayurvedic oils for wounds, Ayurvedic uses of Birch oil, Betula alba, Chemical constituents of Birch Oil, Health benefits of Birch essential oil, Natural remedies for bad breath, Therapeutic properties of Birch Oil by AyurvedicOils. Bookmark the permalink.